Ok yes, we did it! 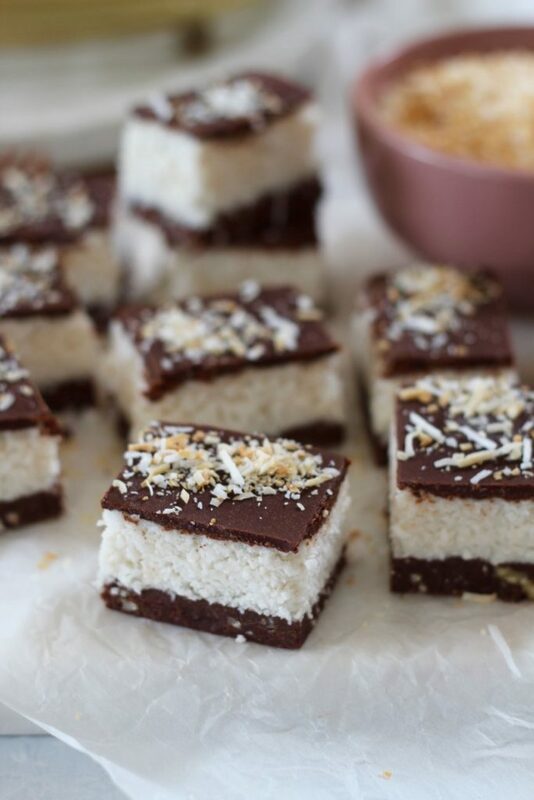 We made Sugar Free Gluten Free and Vegan Bounty Slice Recipe! You’re seriously going to love it! It’s the easiest recipe! It’s brought to you by our amazing blog partner, SupaBarn. Be sure to check them out! We know, you’ve totally been waiting for this recipe! We’ve made it twice just to make sure the recipe is to a T for you! Why do we love this recipe? Well number 1 reason is the easy factor. It’s a 3 layer slice but every layer is a simple whack in your blender and whiz kinda layer. Yeah, we know, our favourite kind of recipe too! 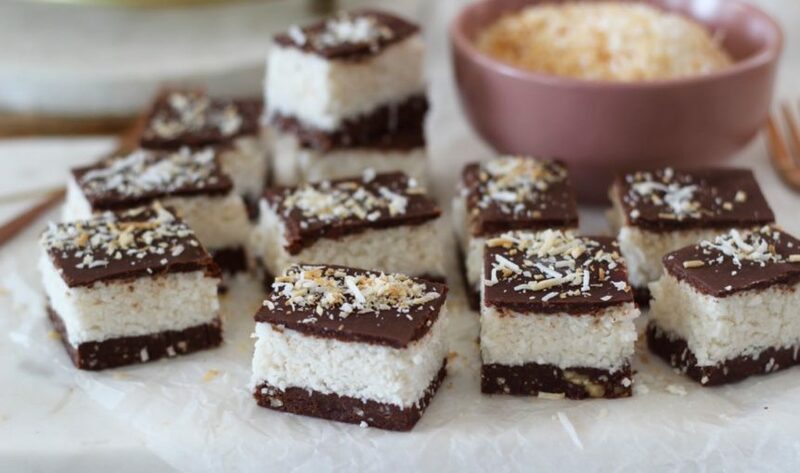 If you’re short for time but still want to impress everyone with a totally amazing, totally drool-worthy and actually good for you sweet treat, then our Sugar Free Gluten Free and Vegan Bounty Slice Recipe is for you! Of course, this recipe and every other recipe on getmerry.com is also on the Get Merry Recipe App along with 100+ App Only recipes! Yahoo! Download to your iPhone or Android today! On to the filling (give your blender/processor a rinse!). Place all of the filling ingredients in to the blender. Blend on medium speed until super smooth. The coconut will still be a little rough, like a bounty! Place the filling on top of the base, press it down and smooth out the top. Now for the icing. Place all of the ingredients in to your blender and whiz on low until smooth. Pour the icing on top of the filling and place in to the freezer for about 1 hour. Once set, slice and ENJOY! Holeeey moleeeey deliciousness! Be sure to place all of your left overs into the freezer, that way you won't eat it all at once! Simply defrost each slice ahead of time when you're read for yummy healthy Sugar Free, Gluten Free and Vegan Bounty Slice!